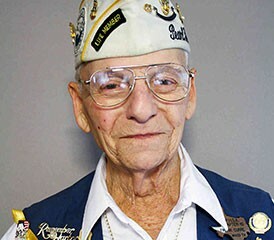 After surviving the horror of Pearl Harbor 70 years ago, surviving mesothelioma never seemed that tough to Frank Curre. He did both, rather admirably. Curre, 88, celebrated Veterans Day on Friday like most every other day, reading his morning paper, and reliving the death and destruction he witnessed Dec. 7, 1941, aboard the battleship USS Tennessee. It was the day the United States was drawn into World War II. The day after Japan bombed the U.S. fleet at Pearl Harbor with a dawn raid, Congress declared war at the urging of President Franklin D. Roosevelt. Curre shared his story recently from Waco, Texas with National Public Radio. Curre was just 17 years old, having graduated from high school that spring. When he was unable to find employment, he begged his mother to sign enlistment papers, putting him into the U.S. Navy. He was shipped off to Hawaii, believing he was headed to paradise island. What he found were the horrors of war. The attacks, coming in two waves, killed 2,402 Americans that day, wounding another 1,282 others. Four battleships were sunk and four others were damaged. Three U.S. cruisers, three destroyers and an anti-aircraft training ship also were either sunk or damaged that day. It came as a stunning shock to America, where strong domestic support for isolationism was replaced immediately by active alliance with Great Britain, which already was involved with the war. Curre saw the start of America’s involvement, up close and too personal. Curre’s mesothelioma likely traces to his service in the Navy and an exposure to asbestos. An estimated one-third of all mesothelioma cases in the United States are military veterans. Although all branches of service used asbestos, the Navy’s use of it has proven to be the most extensive. Here is NPR’s audio version of the story, including an interview with Curre.